I’m James, Joe’s friend and apprentice of alcohol. Loyal readers may remember me from the review I wrote of Bourbon and Branch, a bar in San Francisco. Joe has invited me to contribute to Measure & Stir as an official author. I am honored to be here, and pledge to do my best to help record our experimental drinking sessions for posterity, and to give you a glimpse into our libation laboratory, aka Joe’s place. For my first post, I decided to write about a drink that used an infusion I made. Word of the banana-infused bourbon Joe and I have been mixing with recently had spread around amongst our clique, and Joe and I found ourselves drinking one evening with one such friend, Julian. Naturally it was a perfect opportunity for us to pour out a little more of that beautiful banana booze. As Joe and I pondered what to mix with it, I realized the obvious: chocolate and bananas. I spotted Joe’s crazy-good Theo chocolate liqueur out of the corner of my eye, begging to be synergized with that banana whiskey. 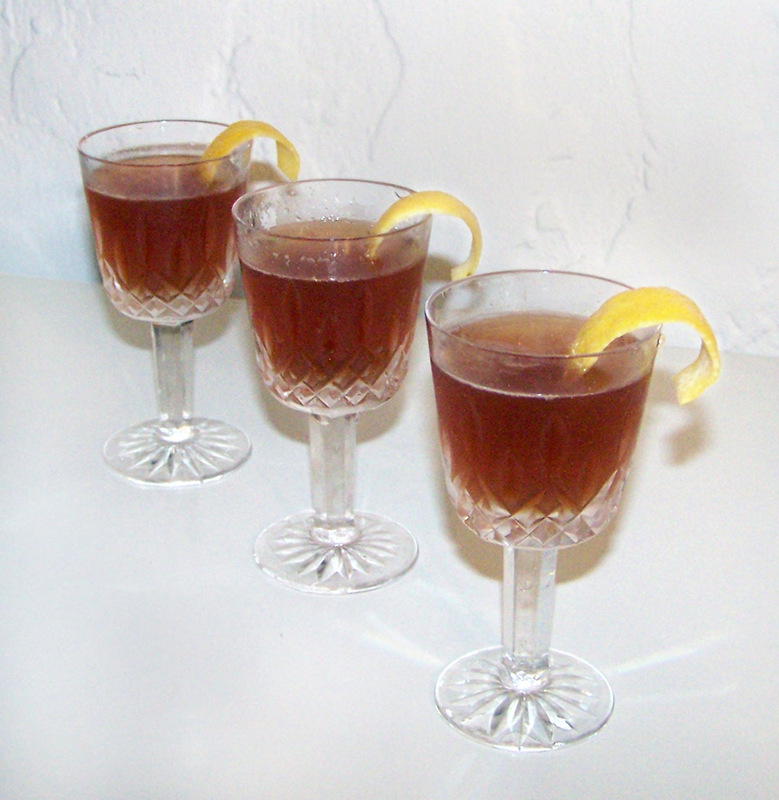 Shake, double strain, and garnish with a lemon peel. We chose to split the drink into three small glasses, so that each of us could enjoy a taste, which was a shame because it was so delicious that I wish we could have all enjoyed our own full-sized drinks. The banana and chocolate combination is as delicious as your intuition tells you. The taste is enhanced by the sweet floral qualities provided by the lemon juice, and the oaky spice from the bourbon completes the drink on the swallow. Joe later gave me this pro tip: Adding fresh lemon juice to a drink can impart a confectionary quality to it. For this reason, Joe chose to mix this drink as a sour. It was a great idea, and this handy hint is worth remembering. Alone, the banana-infused whiskey and chocolate liqueur taste great together, but with a little lemon juice the flavor pops, and the drink becomes candy. Seriously, don’t forget that lemon peel garnish! The aroma from the peel helps this drink pop. Categories: infusions, original creations | Tags: alcohol, banana, bananas, bartending, booze, bourbon, chocolate, chocolate liqueur, cocktail, cocktails, drinking, drinks, fruit, infuse, infusion, lemon, liqueur, mixed drinks, mixology, whiskey | Permalink. What a fun drink. I recently heard about infusing a bourbon with bananas, which sounds almost ideal in a way. Yet when reading about your drink, the grin of the Grinch spread across my face. I think I’m going to have a Banana Split Party. If I may, I might garnish with one addition – a cherry for the aroma (or for those who lavish in eating a cocktail infused garnish). Oh by the way, I forgot to give credit to the infuser. Go to BOOZED + INFUSED (here on WordPress). She’s really knows what she’s doing.